Are you ready? Can you feel it? It's the sheer excitement and gut-swirling thrill of the San Diego Country Credit Union Poinsettia Bowl!!!! Or is it the fever that is the papajohns.com Bowl. I get confused. Whatever! Tuesday at 5pm. Be there!!! Seriously. It's the time of year where we complain about the bowl selections. And we should. The fact that Boise State gets stuck with the Poinsettia Bowl after going 12-0 is ridiculous. It's the Poinsettia Bowl...on December 23. What the hell? What is Boise State supposed to do—you're telling them, that no matter what that college football team does, they can't do better than the Poinsettia Bowl. Or Clemson. By all accounts Clemson doesn't deserve to be anywhere near a New Year's Day game. They went 7-5, for christ-sake, and fired their coach halfway through the season. Yet they get the Gator Bowl. Meanwhile BC, who was in the ACC Championship game, gets stuck with the Music City bowl? Even though BC won the Atlantic Conference of the ACC, they don't get to represent the ACC as the no. 2 team? No Georgia Tech gets to jump them—because the Peach Bowl played in Atlanta wants the local Georgia Tech team— and Clemson and half the ACC gets to jump BC because organizers want closer teams. That's like saying "OK, Rays, you won the American League Championship, but you aren't as lucrative as the Yankees or Boston, so we're sending them to the World Series. Sorry. It's a crap system and it deserves to be tanked. But money won't allow it. Go take a look at my proposal to fix this mess, but which will probably never happen. Even Obama doesn't have that kind of power. Last season's Texan rookie, Amobi Okoye has sort of fallen off the race of the earth, hasn't he? What kind of mess are the Brewers in, huh? They make the playoffs for the first time since the Bronze age, and now are going to lose both Ben Sheets and C. C. Sabathia—or to put it another way, a combined 12 complete games. And now the rumor is, that they will have to trade Prince Fielder—losing 34 HRs and 102 RBIs— just to try to get a pitcher to try to make up for Sabathia and Sheets. Gosh, I hope Ryan Braun likes rebuilding, because that's what this poor kid is in for. Has this Jake Peavy trade gone on since the Space Race? Or does it just feel that way? Has anyone watched those ESPN "Mayne Street" web-isodes. Anyone? Hello? I hope Colt McCoy made the right decision to stay. I just get the feeling his stock is never going to get higher than it is right now, and that all he's doing is risking injury. Just a smart move, Jerry. A smart, classy move. Andaplayertobenamedlater.com's Man of the Week award goes to Brian Westbrook. About a month ago, when Westbrook faced the Giants, he had his head handed to him to the tune of 26 yards on 13 carries. On Sunday, Westbrook torched the Giants stout defensive unit for 131 yards on the ground, and another 72 yards via the air, for two touchdowns and an an embarrassing spanking in front of the Giants home crows. Congrats Brian, you earned it. 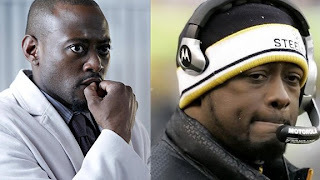 And finally...is it me or does Steeler Coach Mike Tomlin look like a certain foil for Doctor House? Remember the Bluebonnet Bowl? I think thats why the Poinsetta Bowl exists. They had to have one obligitory "gay" sounding game. Good point. The Gaylord Hotels Music City Bowl also has some strength in that area.